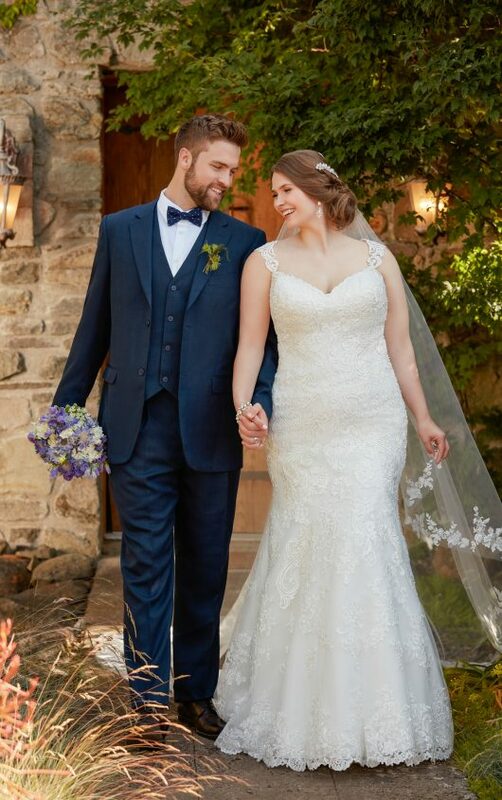 Adorned with exquisite detail, this beaded fit-and-flare plus size wedding dress with silver lace by Essense of Australia is a statement-making gown! Lace and organza over satin combine to create a unique fit-and-flare silhouette adorned with sparkling beadwork and silver lace that shimmers and flatters. Feminine lace gives the illusion of fullness in the skirt without feeling heavy as a scalloped hemline adds romance to the gown. A cutout illusion lace back is the feature of this beaded wedding dress as it draws attention to the shimmering ivory and white beading of the train. This beaded fit-and-flare wedding dress zips up under fabric covered buttons.